Some facts of our city Gothenburg. Gothenburg is a city you can visit when ever. But the cosiest time is the Summer when all the outside restaurants fill the streets. In the fall and spring it can be a bit cold when the winds from the sea comes in. If you would like to come to Gothenburg in the winter time, December is a nice month to come when all of town is lit up by Christmas lights. Not only the City Center! Gothenburg is not only the little area within the old moat. 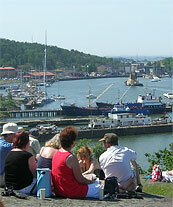 Gothenburg has 20 different areas / Boroughs all with it´s special charm. On your first visit to Gothenburg you might stay in the city center but if you have time take a look outside where you will find forests, green meadows and the sea. Gothenburg is a large city but not so big. It is a great place for walking. As in all mayor cities you can go by buss and taxi. 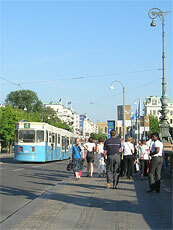 Gothenburg also has it´s trams that take you all over town. 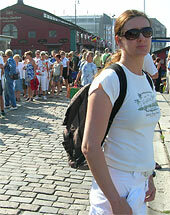 But if you would like to see Gothenburg as we see it we suggest you walk around as much as possible. You will also get some exercise... bring comfortable shoes. The Goteborg wheel are now closed and it will be moved from Kanaltorget to Liseberg. The Goteborg Wheel is opened! If everything goes according to plan construction of the large wheel, at Lilla Bommen, will begin during the month of April. At the end of May the 60 meters high wheel is planned to be inaugurated. So you who are curious about the work site, just go down to the construction site this spring. Several of the world's cities as Paris and London already has its and now Gothenburg get its ... second ferris wheel. Down at the Gothenburg Opera, a giant wheel at a height of 60 meters will be placed. Gothenburg want with the big Ferris Wheel increase the attraction for tourists visiting the city. This wheel will give you a completely new view of Göteborg. Plans are to open in summer 2009.